We look forward to welcoming you in Santiago! Please note that it will be winter in Chile and that temperatures in Santiago fluctuate between warm in the day time and chilly in evening. Doors will open early for Summit attendees. 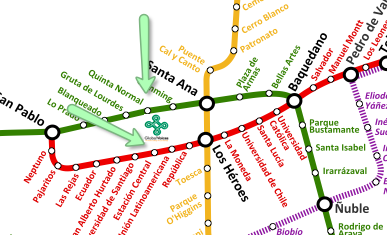 Public transportation is very efficient in Santiago and will probably be your preferred way to get around. Metro tickets cost the equivalent of US $1. 1) Buses (US$ 4-10) the most popular are Centropuerto (blue busses) and Tur Bus (green bus). They will drop you in the center, at a metro station with good connections. If you are going to the Blue Tree Hotel Fundador by cab, transfer, bus, or metro, the reference will always be “Metro Universidad de Chile”. The hotel is right by the university. Global Voices volunteers banded together to negotiate a deal with this hostel that has a blog, Facebook, Twitter account, YouTube channel, and free wifi. Special rate for Global Voices Summit attendees is $10 in shared dormitories. Email Nicolás (or tweet @chelagarto) to get prices for single/doubles. These are a few other inexpensive hotels in Santiago. May is a winter month. Sometimes it rains, and it could be very cold in the mornings and evenings. During the day temperatures can rise up to 25º Celsius. Citizens of many countries need tourist visas to travel to Chile. You can consult your local Chilean embassy or consulate to see if you need one. Here are some links to help you explore Chile and Santiago. As in any city, some parts of Santiago are expensive others cheap. You can find lunch for as little as US$2 or as much as US $70 per person. The average price for a soda or bottled water is around US$1. The currency in Chile is the Chilean Peso (CLP). Check exchange rates. Chile is a normally a safe country, and people are nice to tourists. It's good for backpacking, and you can find a lot of homely and inexpensive places to stay throughout the country. Chile is divides in 13 regions. Since the earthquake, it is still not advisable to go to the Bio Bio and Maule regions, nor to Juan Fernandez Island. For those planning to cross the Andes to Mendoza/Argentina wineries by bus, check the weather at least 2 weeks in advance. Sometimes the roads are blocked because of snow. Alternatively, there are several cheap airlines that fly to Argentina.